I first came across Beanberry, a Woking-based roaster which specialises in organic coffee, when I visited G!RO Cycles in Esher in 2015. We then met in person at the 2017 London Coffee Festival, where I learnt about Beanberry’s then relatively new coffee shop in Kingston upon Thames, an area crying out for good coffee. Fast forward around 15 months, and I finally managed to get to Kingston, a curious mix of historic buildings and ugly concrete on the banks of the River Thames in west London. If you’re hungry, the breakfast/lunch menu is heavy on the bread/toast options, backed up by a decent cake selection. Beanberry Coffee is on Fife Street, a few minutes’ walk from the station (both train and bus), which means that my excuse for not visiting (I had thought it quite hard to get to) doesn’t really hold water. Occupying a rectangular space, perhaps twice as deep as it is wide, its short side, which is all glass, faces the street. Very much a shop of two halves, the bulk of the seating is at the back. Up front, the central glass door is flanked by a pair of two-person window-bars, the left-hand one extending down the window on the left-hand side, which is not much wider than the windows at the front. The counter, almost an island, but tantalisingly not, is set well back from the windows and projects maybe three-quarters of the width of Beanberry from the right-hand wall. The till, at the front, is flanked by pour-over (right) and cakes (left). 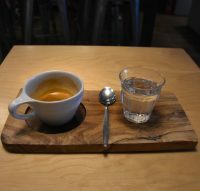 The espresso machine, a three-group La Marzocco Linea, is down the left-hand side, with three two-person tables tucked in against the wall opposite. You can also sit at the counter itself, with three stools at the high bar by the four Mahlkönig espresso grinders (a Peak, EK-30 and EK-30 twin). The main seating area, probably occupying as much space as the counter, is at the back. There are two bracket-shaped padded benches, one against each wall, each with three two-person tables, with a tall, narrow, ten-person communal table in the middle. With the exception of the padded benches, the seating, front and back, is on tall, square stools or low, round stools. Beanberry has dark, wooden floorboards, dark grey walls, counter and ceiling, along with exposed air-conditioning ducts. It can be loud when busy and, while the front is very bright, the rear is best described as subdued, despite lots of lights, although I suspect that it’s probably brighter than it feels, such is the contrast with the sun-lit front. As you might expect from a café/roaster (although it’s not always the case), there is plenty of choice, with pretty much all of Beanberry’s output available to drink. The coffees change regularly, including the blends, with Beanberry buying in small batches and moving on when they’re done. The greatest choice is available on pour-over, where the 8AM Blues blend is joined by up to six single-origins. While I was there, there were five choices, with three Ethiopians, a Guatemalan and Peruvian micro-lot. One of the Ethiopians, from the Negele Gorbitu co-operative in the Yirgacheffe region, was also available as the single-origin espresso, where it was joined by a Colombian Cauca decaf, using the sugarcane method. I decided on the Ethiopian single-origin as an espresso, although had I had more time, I would have also tried it as a pour-over. A washed coffee, it was absolutely lovely, although I completely lack the palate and vocabulary to describe it. Not what I was expecting though, compared to previous Ethiopian espressos. This was darker, and very complex. Served in an over-sized cup with a large handle, it came on a wooden tray with a glass of sparkling water on the side, a little touch which I appreciated. I followed this with toasted jalapeno cornbread, a muffin-like delight that came with a side of jam. Having learnt my lesson from previous ordering mistakes, I asked for this to come after the coffee and for once I got it right. The chillies in the cornbread were pretty hot and would have ruined my appreciation of the coffee, although the jam really took the edge off of the heat, which I definitely needed. This entry was posted in Breakfast, Cafe/Roaster, Cafes, Cake, Kingston Upon Thames, Laptop Friendly, Lunch, Retailers, Stations Nearby and tagged Beanberry, include by Brian Williams. Bookmark the permalink.